2 Stocks That Could Have Better Dividends Than Verizon Communications Inc.
AT&T and Consolidated Communications offer higher yields than the wireless leader. Verizon Communications (NYSE:VZ) is generally considered a rock-solid dividend stock. It currently pays a forward annual yield of 4.2%, which is double the S&P 500's average yield of 2.1%, and has hiked its dividend annually for nine consecutive years. Over the past 12 months, Verizon paid out 76% of its free cash flow as dividends, indicating that it still has plenty of room to raise its payout. The company's sale of slower-growth wireline assets and aggressive investments in wireless infrastructure, fiber-optic networks, and digital advertising could also generate fresh high-margin revenue and complement its market-leading wireless position in the U.S. Analysts believe that those strategies will enable Verizon to grow its earnings by 4.5% annually over the next five years -- hardly explosive, but enough to support long-term dividend growth. But as reliable as Verizon is, two other telco stocks might offer slightly better income growth than the wireless leader: AT&T (NYSE:T) and Consolidated Communications (NASDAQ:CNSL). AT&T trails behind Verizon in total wireless subscribers, but it recently evolved into a pay TV behemoth with its acquisition of DirecTV. That move boosted AT&T's free cash flow -- the source of its dividends -- by 60% to $15.9 billion in 2015. It then spent 64% of that cash on dividends, and plans to bump that payout ratio to "the 70s" this year. AT&T expects robust demand for pay TV services across Latin America to bolster its free cash flow this year, although currency headwinds across the region remain tough. Analysts believe that support will lift AT&T's earnings by 5.1% annually over the next five years. That forecast gives it a 5-year PEG ratio of 2.7, which is slightly cheaper than Verizon's PEG ratio of 3. 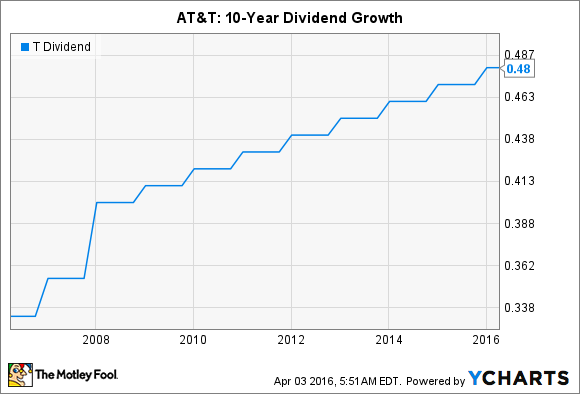 AT&T is also a Dividend Aristocrat that has raised its dividend for more than three decades. Those factors all strongly indicate that AT&T's current forward yield of 4.9% -- which is already higher than Verizon's -- will likely hold steady even as its stock price rises. One concern that has dogged AT&T is its rising debt levels. Ratings agency Moody's (NYSE:MCO) notably downgraded AT&T's senior debt rating last year, claiming that its $18.2 billion purchase of spectrum licenses and its $49 billion acquisition of DirecTV raised its debt to uncomfortably high levels and could threaten its dividend. But as I countered in a previous article, Moody's downgrade glosses over the cash flow benefits from DirecTV, its wireless expansion into Mexico, and its ability to divest assets instead of suspending dividend hikes. Consolidated Communications is a leading wireline services provider for rural customers in California, Illinois, Kansas, Missouri, Pennsylvania, and Texas. Last quarter, Consolidated's revenue dipped 2% annually to $188.2 million, partially due to the sale of a small billing support services company and weak sales from its low-margin equipment sales and service business. But on the bright side, Consolidated added 3,800 data customers, representing its highest quarterly growth in over three years, boosted commercial and carrier revenue by 3.8% annually, extended its fiber route miles by 11% throughout the year, and grew its metro and cloud-hosted voice lines by the double digits. Consolidated's wireless partnerships with Verizon also generated $11.2 million in cash during the quarter, up from $9.2 million a year earlier. On the bottom line, it reported an adjusted net profit of $4.7 million -- a return to profitability from a pro forma loss of $6 million in the prior-year quarter. Consolidated pays a hefty forward annual dividend of 6%, which is much higher than Verizon's or AT&T's yield, while its payout ratio has remained at a sustainable 67% over the past year. Analysts currently expect Consolidated to grow its annual earnings at a steady 2% rate over the next five years, which should support its long-term dividend payments. However, Consolidated hasn't raised its dividend since its IPO in 2005, so investors looking for consistent dividend growth might want to look elsewhere. But investors who want a big, steady yield, decent price growth, and sustainable payout ratios should take a closer look. I believe that AT&T and Consolidated Communications' higher yields are worth checking out. However, investors should also remember that yield isn't everything, and that earnings growth, free cash flow, payout ratios, and dividend hikes define how reliable an income-generating stock is. Therefore, investors should check if AT&T and Consolidated Communications tick all four boxes before buying them for passive income. Which Telecom Is the Best Dividend Stock?